Yeah, yeah, it's lame. So shoot me. 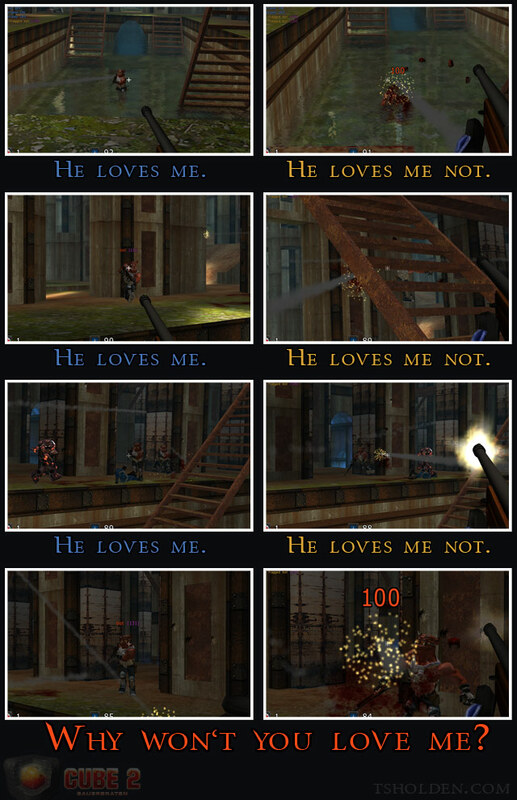 I like the idea of a lovelorn sniper. A couple of art notes. I was hoping to feature the ragdoll-ness a bit more, but the shots immediately following the impact had more, to use a bad pun, impact. Also, most people probably won't notice this (though I tried to highlight it in the last panel), but I'm using font colors based on the Sauer colors. The font is very different (I just like the font), but the colors are significant. Made with Photoshop CS3 and Sauerbraten. Special thanks to Quin for the bots, they were most obliging.